Four 'Star Trek' stamps that will be released to commemorate the franchise's 50th anniversary in 2016. Set phasers to mail! With space as much a "final frontier" today for "Star Trek" fans as it was in 1966, a new set of stamps will commemorate the sci-fi franchise's 50th anniversary. According to the U.S. Postal Service, the four stamps are supposed to be inspired by "classic elements" of the first television series of the "Star Trek" franchise, which aired between 1966 and 1969. The show followed the exploits of the USS Enterprise and its crew, helmed by Capt. James T. Kirk. Its goal was to fulfill a five-year mission by looking for new civilizations and new worlds, and by boldly going "where no man has gone before." The Enterprise seen inside the outline of a Vulcan hand salute, most famously shown by the alien Spock along with the line, "Live long and prosper." This is set against a blue background. 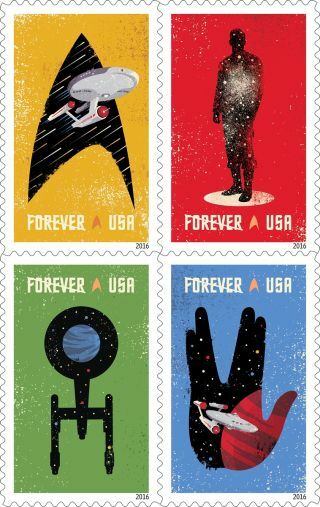 "The words 'SPACE… THE FINAL FRONTIER,' from Kirk's famous voiceover, appear beneath the stamps against a background of stars," the U.S. Postal Service added in a statement. "The stamps were designed by Heads of State under the art direction of Antonio Alcalá." This year, "Star Trek Beyond" will be released in theaters; the film stars the same rebooted "Original Series" cast that has made several film appearances since 2009. "Star Trek" is one of several space-themed stamps that the USPS will release in 2016. The USPS also will send out "Views of Our Planets" showing full-disc views of the eight planets in our solar system, and a commemorative stamp showing the disc of Pluto, first visited in 2015 by New Horizons.